On April 21, 1836 the Texas Army under the command of Sam Houston launched a surprise attack on Mexican forces under the command of General Antonio Lopez de Santa Anna near the San Jacinto River. It would last eighteen minutes. The Battle of San Jacinto significantly changed the history of the US as well. It not only gave Texas its independence from Mexico but it would also included parts of future states of New Mexico, Oklahoma, Kansas, Colorado, and Wyoming. The Republic of Texas would become the State of Texas in 1845 launching another war with Mexico in 1846. This war in which the US would win over Mexico secured territories of the states of California, Colorado, Arizona, Utah, Nevada, Wyoming and New Mexico. The Treaty of Guadalupe Hidalgo would give the United States its contiguous land from the Atlantic Ocean to the Pacific Ocean. All this territory is from a battle that lasted only 18 minutes by a rag tag army of volunteers against a superior military force. 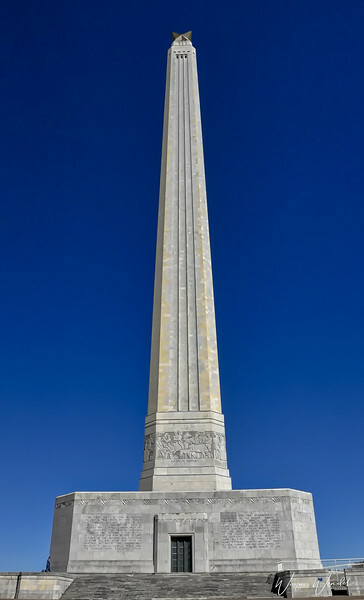 The Battle of San Jacinto was a most significant event in history. 1. It was built in 1936-1939 and funded by a now defunct government agency, Reconstruction Finance Corporation. 2. It cost $1.5 million to build the monument. 3. It is 567 feet tall, 12 feet higher than the Washington Monument. 4. There is an elevator that will take you to the top for a breathtaking view of the Houston Ship Channel and the battlefield. I love this monument and it's history and have ever since I saw it for the first time in probably the mid-1970s when I was living in Houston. Your POV is absolutely perfect. You nailed this shot! Superlative composition and an awesome blue backdrop to offset the color tones of the Jacinto Monument! Super capture of the monument. I can only imagine the beauty of the view from the top. Great piece of American history - always nice to learn something new. Interesting history led to this monument. If that's a fast elevator, may need decompression after going up or down! Wonderful image and great history of the Battle!